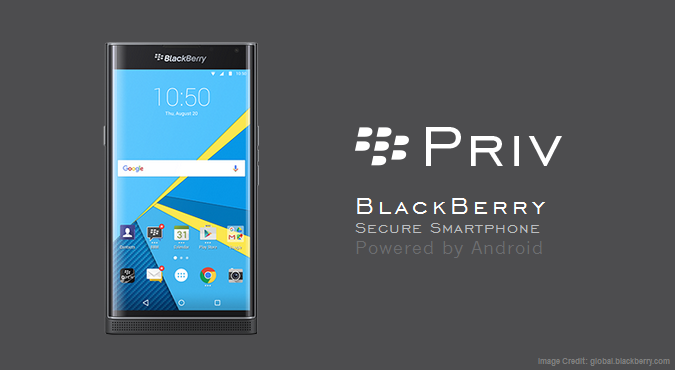 ‘BlackBerry Priv’ – The New Smartphone In Town That Is Powered By Android OS! There has been a lot of buzz since a while regarding BlackBerry launching an Android smartphone, given that this is a ‘make or break’ situation for the company. Putting an end to all the gossip, Blackberry has recently announced their latest Android- powered (Android 5.1.1 Lollipop) handset – BlackBerry Priv. What is interesting to note here is that, ‘Priv’ is the first smartphone made by BlackBerry that is working on an operating system that is not its own. And what makes the new Blackberry Android Phone even more unique is that the company has collaborated with Google to provide the consumers with the best of BlackBerry security and productivity under the Android ecosystem. Additionally, this new version is also has a slick slider keyboard attached, making it one of the only few smartphones in the current market to offer something of this sort. This feature could also help Priv stand out. It has already been made available for pre-order starting at $699 and its shipping shall begin from 6 November in the US. Snapdragon 808 Hexa-Core, and a 64 bit processor. Additionally, the phone also consists of an 18 mega pixel dual-flash camera, 3 GB low powered RAM and an internal storage of up to 32 GB which can be expanded up to 2 TB via microSD card slot. The phone also offers a battery life of up to 22.5 hours. But the smartphone’s “wow factor” is actually their slide out physical keyboard, which makes them stand out in the crowd. Talking about security; now many of us know that security has been a long-standing problem with the Android phones and more than 1 billion Android devices as of date stay exposed to the ‘Stagefright’ exploit. To give you a brief idea, Stagefright bug is something that lets the attacker remotely execute a code using Multimedia Text messages, which often the users won’t even see. It is known to be the biggest Android security problem since a very long time now and almost all the Android phone users prone to attacks. Hence, in an attempt to counter that, BlackBerry has applied its world-renowned security model to the Android OS. Priv offers a pre-loaded brand new ‘BlackBerry DTEK’ application, which is specifically designed to help you control and protect your privacy. It tells you when your data could be at risk, which apps access your personal data, and also shows the overall security of your device based on various factors. Giving credit where credit due; BlackBerry indeed has a long history of holding the best, private and secure mobile solutions‎. BlackBerry OS was the first one to provide secure email and applications on mobile devices. And when BlackBerry and Google come together to design a ‘secure mobile platform,’ with the most flexible application ecosystem, it does not need a lot of brainstorming to understand that, it is going to be the best.